Create Unique Birth Chart With Our Natal Chart Calculator. It is very easy to use our free birth chart system to calculate your personal natal chart and get an explanation what this means for you. In some countries in summer period of time, arrows transfer to one hour forwards to add one hour of light time of day. Location data Note: You don't have to fill in 'Time zone', 'Longtitude', 'Latitude' fields if we got your place data recorded. Just fill in 'Place'. Disclaimer: No guarantee is given that the program necessarily works as intended, nor is responsibility taken for any use or misuse. Fill in your date of birth, exact time of birth, and place of birth. Also the longitude and latitude of place of birth (in case it is not found by our program). Now you will see the hexagram wit the symbolic signs in it. It is the natal birth chart itself. Under the picture you will find three tables that decode the meaning of the symbols. First table shows the position of planets in your chart. Second shows the poison of signs in houses at the moment of your birth. And finally the last table helps you find out everything about aspects between planets in your birth natal chart. All you have to do now is follow these links and read the descriptions. Birth Natal Chart. Horoscope is too general to be of individual benefit. 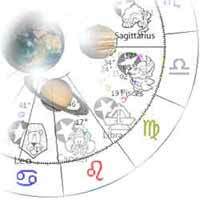 A natal chart showing signs, houses, planets, and aspects for a fateful moment. Try to break through emotional barriers between you and your beloved. You should learn when to care and when to back off. You should refine and broaden your emotional palette. This is certainly not the best time to tell everyone about either your new project or problem. Keep in mind that escaping can be pleasant but often unproductive. The best thing you can do is to be yourself. Try to be patient today and act intelligently. Don't just observe the passing parade - try to make differences. Remember that compromise often necessary. Remember that difficulties demand resources. You know that your beloved won’t appreciate the fact that you are always offended by her/his jokes. Set things up carefully and allow enough space for other.